I'm not sure what the kid's doing all night long. Looks like she's practicing for a nuclear lockdown. How can someone so tiny wrestle a sheet, two blankets and a heavy comforter from a 175 pound man? And that's not the worst of it. Sometimes she awakens me yelling in the loudest, most insane sort of way. "NO! NO! I DON'T WANT TO GO! I'M NOT GOING!" My dad said my mom used to have nightmares about snakes. He told me she'd belt out the loudest scream you could imagine smack dab in the middle of his REM. It scared the $%&# out of him. "DON'T MAKE ME! I'M SCARED. NO! NO! I'M NOT GOING!" She probably thinks I'm gonna take her back to the NC State bowl game in Nashville. I sort of have that same feeling, it was ugly. 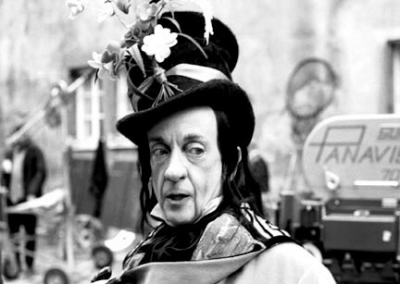 When I was a kid, I remember laying awake for hours scared of the kid snatcher from Chitty Chitty Bang Bang. UUUghhh. I get chills thinking about him today. He was just creepy. Puttin' kids in a cage. What an awful thing to take your child to see mom and dad! That's probably half of my issues today. And then there's Stephanie - she's sort of like sleeping with Darth Vader. "Wheeeeewwwww - wwwwwweeeehw. Wheeeeewwwww - wwwwweeeeehW." It's like snoozing through a drag race. I don't think she has emphysema, but it sounds like it. Occasionally DJ gets stuck with me at the beach or in a hotel on vacation. She's pretty still but she always faces the middle of the bed. I just don't like someone else's breath near my face. And I can only sleep on my left side for so long and then it feels like my aorta is about to pop off my ventrical. My heart starts aching after about 20 minutes and I gotta rotate. I look at people in movies. The woman always sleeps with her head perched between the guys armpit and his shoulder. Her hand resting gently on his bare chest. The only things asleep in that picture are his arms. One is crushed beneath her torso, the other void of blood because it's been over his head for the past umpteen minutes. Who in the heck sleeps like that? That dude is thinking, "I can't wait for her to get off of me so I can get some stinkin' sleep." Now Lisa, she was a good queen bed partner. If there was snuggling, it was pre-sleep. Once the lights went out, it was like she was in Raleigh, and I was in Durham. No touching, no shared breathing, no cover hog. Just a quiet doze and the comfort of knowing someone else was nearby. One thing is for sure, having someone next to you is nice - be it a gorilla, Darth Vader or a bad breathed teenager. That picture sure does looks nice, doesn't it?